“World Of Tomorrow” tells the story of a young girl, Emily, who is pulled out of her own time by a clone of herself, contacting her from the future. The poetry of the movie comes from the contrast between the sorrowful and wizened story of her genetic descendent, and the carefree and imaginative world of little Emily. (You can rent the film through Vimeo.) A radical leap forward for Hertzfeldt as both an animator and an artist, it’s a creative breakthrough in several regards (see Noel Murray’s take from yesterday), but primarily in the sense that it’s a giant leap into digital animation for an artist famous for his meticulous hand-drawn style. In a conversation somewhat colored by the nasty head cold he was fighting, the filmmaker discussed making the leap to digital animation, the folly of trying to direct a 4-year-old girl, and why multitasking is a cure for depression. The A.V. Club: Well, I hope you feel better soon. DH: You like how I started by just complaining? Like, I just launched into complaining? AVC: If I had a bad cold, I’m sure I wouldn’t want to do anything all day, let alone interview after interview. DH: Nah, it’s for a very good cause, so I’m all in. AVC: This film is a big shift in animation style for you, going digital. Was part of the appeal seeing how far you could push the creative contrast between the new digital animation and the old, basic stick-figure design? DH: The whole thing was a massive learning experiment. I mean, I’m still learning. I’ve never done a digital project like that before. And I’m pretty sure I did things to the software that weren’t supposed to be done. The whole film is only Photoshop and Final Cut. I’ve been told I should get into After Effects, but I haven’t opened it yet. And of course, Pro Tools, for the sound, but just those three programs. The other animation software that was recommended to me in the beginning, I hated it. It was terrible. So I just kind of fell back on Photoshop. But I had never drawn on a tablet before. I’ve been doing pencil and paper and film for almost 20 years. I wanted to try something different. I wanted to teach myself some digital stuff in advance of a bigger feature project that’s coming up, and I took to it really quickly. I was actually a little surprised. I have friends and illustrators who can’t stand drawing on the Cintiq. [A graphic pad tablet used by digital animators. —ed.] There’s a certain tension and friction when you draw on paper that they miss. The tablet is very slick. It’s like drawing on glass. But that didn’t bother me at all. I took to it pretty quick, then I got very addicted to the speed of it. It was night and day speedier than the old process. And with “World Of Tomorrow,” I didn’t want to fuss over anything. I approached every shot every day without any storyboards, without any pre-planning and I animated it pretty chronologically. Everyday I’d just look at the script and say, “Okay, today it’s a shot, they’re on the moon. What does that look like?” I designed it from scratch. And it got to the point where if I didn’t finish a new shot every single day, I’d start to get a little depressed because I was so used to the speed of it, and I didn’t want to have to linger on shots too much. And I think that it just really helped the look of it. I wanted it to look like a children’s book. I wanted it to look very flat, very colorful with textures, and it’s interesting for me to imagine it from someone else’s point of view. Because I kind of feel like it’s like a rock band who traditionally was guitar, guitar, guitar and then for their new album, they’re like, we’re going electronic. But they only use Casio keyboards and they only use drum machines. It’s a very ironic way of going electronic. It still looks like it could have been made in the ’90s, which I kind of like. It’s not the cutting edge CG we’re all used to. I think there’s a certain charm to the fact that I had no idea what I was doing. [Laughs.] And I still don’t. I think it was very free in that sense, because I wasn’t aware of any parameters. WORLD OF TOMORROW - Trailer from don hertzfeldt on Vimeo. AVC: And it felt very much like that fit the story you were telling—that the animation is expressive in this childlike way to Emily. Were there specific artistic touchstones or influences that you were drawing on to achieve that storybook look? DH: The main one that I had in mind was, I love the look of those very pulpy old ’50s and ’60s science-fiction journals and dime-store novels. That very modern design that’s very sleek. The ones I would come across over and over, the design is a really flat primary color with all sorts of abstract geometric shapes, just implying something. And then you’d have your characters running from something with guns. It was very expressionistic. So that’s really what I was looking at when I was coming up with all those shapes and things. We made over a dozen different drafts of our DCP [digital cinema package]. Because traditionally, digital projects, when you project them, they get really washed out. It’s complicated stuff with gamma, but basically your blacks get very milky and the colors get very weak, and we made so many different versions of it to just pump more color into it, so it would look just as good in the theater as it does on your screen at home. And color was my constant whine. It needed to be very oversaturated. AVC: It’s Such A Beautiful Day had so many optical effects, with image marrying, multiple exposures shot through magnifying glasses, that whole thing. This film is much more direct. Was that a storytelling technique, or was it the experiment into digital filming generating its own set of artistic inspiration narratively? “World Of Tomorrow” is an interesting reverse of that. It’s very expressionistic. It’s very vivid, but it’s still seen through the eyes of a child and there you have the children’s book look again. Most of the time the writing, the visuals, all of these things, how they marry, I have no idea until I’m in it and doing it and bringing them together. Most of the visuals are happy accidents and things that I would never have pre-visualized. When I did the Simpsons piece, for instance, one of the steps in our original agreement was, okay, please deliver us a synopsis, please deliver us storyboards, please deliver us an animatic. I don’t storyboard, I’ve never made an animatic for anything. [Laughs.] And so I was just like, “Guys, can I just deliver the thing and if you don’t like it, I can go back and change things?” Which is what I did. I feel like if I had to pitch projects, if I had to storyboard projects, they’d be very uninteresting. It’s not really until I’m in it that the sparks are actually happening to make an interesting image. AVC: It’s interesting that you mention how impressionistic It’s Such A Beautiful Day felt, versus how expressionistic World Of Tomorrow is, because they feel very much like companion pieces. You go from a film about losing your memories to a film where it’s all about the quest for eternal memories, and how even those aren’t forever. What is it about the nature of memory that keeps you coming back to this subject? DH: Yeah, in the Simpsons piece I realized it’s all about memories as well. When somebody says, “I want to live forever,” or “I want to live a very long time,” or you read about future science and life extension and there is a very real science about cloning bodies for not just organ harvesting, but for yourself to inhabit when you get old enough for this body. And what’s interesting is when you talk about that—“living forever” or as long as you possibly can—what you really want is a continuance of your memories and your experiences. If I said you could live another 200 years, but we’d have to reboot you, that’s not attractive. Nobody wants that as much as a continuance of your experience. To me, that’s where memories are very interesting because what happens when we start losing memories? What happens when you can’t take your memories with you? Who are we without our memories, without our past? So, you’re right, both films really do play with that in different ways. It’s something that I’ve always been circling. And of course, they’re really themed films about death. But also about what it means to be aware of that and how we live our lives with that at the end of it. I love the idea of an older person being able to speak to a younger version of herself. Something we’d all love to be able to do, I think. [Laugh.] Go back and say, “Okay, listen: Don’t do this. Do this. Talk to this person. Don’t go out with this person.” And of course, the younger person would not listen. The whole thing would be blown off. And I loved that the older Emily, who can be a reflection of myself, [she’s] not death obsessed, but it’s constantly there. Doom and gloom reality versus this little ray of sunshine, which is this pure childhood optimism. They’re both looking at the world, but in completely different ways. The chemistry there was just magic for me when I finally saw that. AVC: The older one telling a story to a young child allowed you to do almost two stories at once. In some ways, there’s a very straightforward narrative with a high-concept premise, almost like a fable. But then you still allow yourself the room to play around with her memories. Did the structure come to you first, or were you excited by the idea of also trying to tell this very straightforward point-A-to-point-B story? DH: Boy. Your questions are so good and I don’t feel like I’m smart enough to answer them. [Laughs] I frequently run into this, where I genuinely feel like—and this is not just my head cold talking right now—I often, and this is going to sound weird, but I often feel like the guy who makes these movies is smarter than me. Smarter than the guy on the phone right now. How can I explain this? So much of the writing is not conscious, in the sense that it’s not calculated. I remember in film school we had so many studies with big fancy words where you could dissect a movie and make charts of all of the characters’ complicated inner relations and themes and what does this mean? And it’s overwhelming as a student. You’re like, I have to think about all of this when I write? Oh my God, this is crazy. And I never think about any of that stuff. It’s great for a student, but as a writer, it’s paralyzing. And so many times people will point things out in the films—years after the fact—that I’ve never been aware of. There was a write-up recently about It’s Such A Beautiful Day, about the second chapter, “I’m So Proud Of You,” how there are separate images throughout the story. It starts with water. And there are images of fire and images of clouds and air and there are images of mud. It’s the four elements. The write-up was about how the four elements in the story represent nature and these forces that Bill cannot control in his own genetic destiny. That never crossed my mind. But when I look at it, I’m like, “It’s there. That’s really valid, because why did I have close-ups of fire, water, close-ups of mud and air?” Did I think of that on some level? I have no idea. I’m an idiot. So I wrestle with it a lot because the more I think about it, the more poisonous it is to what I’m currently writing. I think some of this just feels right. You’re in the shower and you come up with a sentence and it’s beautiful. You don’t know how it’s going to fit in the film, but you put it in because it feels right. This is a very long way of saying, so much of it is me feeling like I’m catching ideas rather than coming up with ideas. It’s very fluid like that. AVC: So maybe the film mirrors your process. Like little Emily, you’re trying to notice all the weird little random things. DH: I think both the writing and the visuals in that sense are very exploratory. It goes back to my rule for myself [in] making it. I didn’t want to stress over it, which is very easy to do when you’re working with film and paper because the process is that much more grueling. And what was interesting about the writing of “World Of Tomorrow” was, I was working with a 4-year-old. 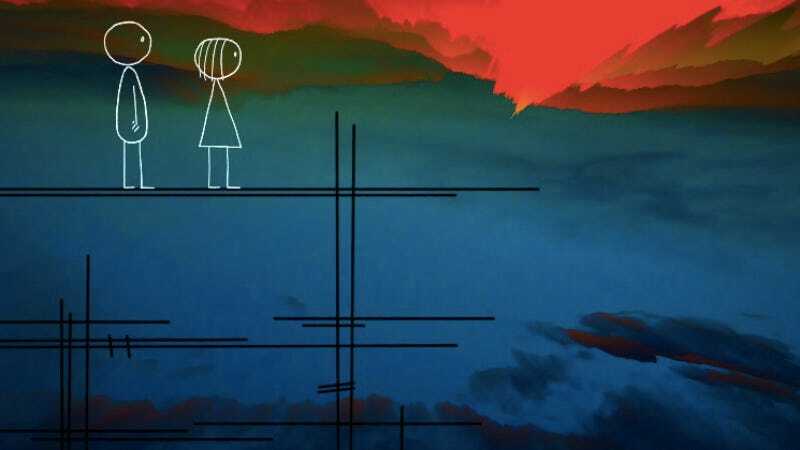 [Hertzfeldt used recordings he made of his 4-year-old niece as the lines for young Emily. —ed.] When I recorded her, she was the very first step. I knew if I didn’t get her, there would be no film. Because I didn’t want to fake it with a child actor or with a fake child actor. She needed to sound purely like a 4-year-old. But I was super naive to think I could get her to recite lines. And I recorded her quietly while we drew pictures and hung out and played and just talked about the world. And what was interesting about that was, it became like working with an improvisational actor. Everything she says is just her in the moment, being herself. She lives in Scotland and I live in Austin, so I only get to see her, like, once a year. And the recording session was very limited. We only had a couple days to be together, so this was it. I had the very strict parameter of this recording session—this is all the little girl talk that you’re going to get. And that was a really great limitation for me as a writer. “She’s saying this. Okay, I have a clean take of that. What could she be looking at? How can I make this all work?” And in a sense, it was like working with another writer and it took a lot of the pressure off of me because I didn’t have to come up with everything. I was just working with what I got. And it helped me relax a little bit about the process as well. I saw her again, my niece, last December, and she’s 5 now. And I thought to myself, “Well, maybe I’ll record her again.” You never know. I didn’t know what I was going to get the first time. And just from the age of 4 to 5, she’s completely, completely different. She’s directing me now. She’s just like, “Okay, I’m a pirate. [Laughs.] You’re a monster, this is hot lava, we’re on the spaceship,” and it’s just these paragraphs of stuff. And all of that childish wonder and reactive stuff from the year previous is gone. Now she’s dominant. And I realize now what kind of lightning in a bottle those recordings were when she was just 4, because that little girl’s gone, and that cannot be captured again. It’s just so magical to actually see her animated now knowing how shaky those recordings were. [Laughs.] And how rare it was to capture that. AVC: Were those conversations the inspiration for the film as a whole, or had the idea of the structure come prior to incorporating that element? I wanted to get the essence of what it’s like to hang out with a 4-year-old. You have these important things to tell them, you think, but they’re fixated on colors and shapes and simple beauty. When I would take her to the park, which was just a few blocks from the house, it would take forever, because she’d stop every few steps and say, “Look. A tree.” And you’re like, “Oh yeah, it’s a tree.” And we’d go a few more steps, she’d say, “Look. A bird.” Okay, yeah, that’s a bird. You realize, wow, all of this is new to you still. I wish I could see the world like you. And I felt I was at risk at the end of “World Of Tomorrow” of getting a little preachy. Because [future Emily] has a lot of important serious things to say. “Now is the envy of all of the dead.” She’s got this monologue about doom and gloom and Emily Prime is like, “Okay.” Just blows the whole thing off. It was a really nice release valve for the writing. AVC: How much did those stories and memories change as you were animating and developing and discovering what you were playing around with? DH: They’re all a little different. For instance, do you mean visually or for the writing? AVC: I mean for both, because I assume they both have things that you would change—as you discovered a new visual element, it would make you want to revise some of her stories, versus you really wanting to get a particular memory in and how to animate that. DH: Yeah. The only story whose look I wanted to be specific about was the story of the boy in the tube in the museum. That story first appeared a couple of years ago in a graphic novel I did that nobody’s heard of. [Laughs] In the graphic novel, I did the entire story on Post-it notes. Then we enlarged the Post-it notes so you could see a lot of the texture. It’s more of an arty book than a real narrative graphic novel. So I was just used to seeing that story told with that yellow Post-it note color, and so that bit is very papery and partially animated on Post-it notes, just because it’s the way I kept visualizing it. And the others were more free, like I was mentioning, just everyday invented on the spot. DH: I think probably give or take about nine months. I did the Simpsons at the same time. Right in the beginning. They contacted me two weeks after I started “World Of Tomorrow.” I had just taken my Cintiq drawing tablet out of the box. I started this one and then The Simpsons got in touch. So I really hit the ground running with all of this stuff. AVC: Do you feel like they sort of ended up influencing each other? DH: Oh, definitely. What was interesting was, The Simpsons was something that I was talking to, I think it was Bill Plympton, many years ago, because he did a couch gag for them. I think he’s done a couple actually. But the first one he was telling me about, he mentioned the pressure of it. He’s another independent animator and he said more people saw his opening for The Simpsons in that one night than had seen his previous independent work for 20 years combined. [Laughs.] It was just this massive, like, “My God, the pressure of doing something like that.” Of course, back then I thought, “What would I do if they ever asked me to do something?” It’s just an idea you turn around in your head for awhile. And the weeks went by, and I was like, “There’s nothing. I can’t think of anything I would do. I’m kind of glad they haven’t asked because I’d be paralyzed. I have no clue.” Fast forward years later when they did ask, I was like, “Oh, man, this again.” I don’t want to say no, but I don’t have any ideas. Within 24 hours, the whole thing was almost fully formed. It’s amazing what real-world pressure can do to something in your head to keep the creative engine going. I have to imagine also it was partially because I had started “World Of Tomorrow” and I had the futurism stuff on my mind. It’s such a weird TV show. When you break it down, it’s a show that’s been on for 20—what is it, 25 years? DH: Yeah, and the characters don’t age. It’s very unique because it’s animated and they don’t age, but they evolve. They look very different than they did in the 1980s. Thinking about memories, Bart is a character who is 10, I think, in this show, but does he have memories from events from 20 years ago? Because it does seem to happen in real time, in a sense. I remember when Bob Dole was on during the election from like 1996. So, very freaky thing when you kind of break down how the show operates in time. What would happen if this longest running show on television just never ends? The original talent is long dead and buried and it just turns into this corporate nightmare where Marge is spouting fascist political things. It was just so much fun to do that. I’m still surprised that it actually happened. They were completely hands off. It just seems unheard of. AVC: And it got a huge reaction. It must feel kind of weird playing around with such iconic characters. Or did you take to it very quickly? DH: It was super fun. The pressure of it didn’t get to me until the day of the airing. Like, for some reason it didn’t bother me while I was working on it, maybe because I was drawing Homer the way I draw stuff and it just didn’t look like… You know, when I did the first bit, when Homer runs in and sits down, that was animated over at the Simpsons traditionally and I just directed that bit. That felt more weird to me, because that’s actually Homer Simpson that I’m directing. Rather than the squid thing that I’m drawing. It felt more like a short film I was doing for them. On the day of the airing, I started getting kind of freaked out and my friends made me do a couple shots to relax. You’re wondering what could possibly go wrong right now. Is it going to air with no sound? [Laughs.] Did the Fox censors step in and change everything and they forgot to tell me? I think that was the only moment where I kind of felt the weight of it. DH: I don’t know. [Laughs.] I feel like most viewers experienced a weird gentle seizure and just forgot about it. It’s really hard to tell how this stuff is perceived. They told me like 8.5 million people saw that premiere, so it did something. But I’m so isolated from it. I’m not in every living room. AVC: Now you’re doing Antarctica, this feature-length animated film with Snoot Entertainment. How far into that are you? But the script has been written for a long time and been rewritten many times. It’s a bigger-budget project and it’s going to obviously have a bigger crew than just myself and the handful of people I usually work with. So, for me, it’s learning to be patient with this process. It’s the opposite of what I’m used to, which is coming with an idea I can start animating right away, without pitching it, without raising money. So we are just getting started with pre-production. There’s going to be a lot of visual tests coming up. It’ll be a slow, slow, slow thing. Recently I’ve been working on multiple things at the same time and that’s been really good for me. I feel like when you work on a project and finish it, you relax and the creative part of your brain, whatever it is, it’s like a little engine and it will sort of slow down and when you’re ready to start something new, maybe a couple months later, it’s difficult to get that revved up again. Lately I’ve been happier and better at working on more than one thing, just to never let that engine stop. So, this project, that project, Simpsons, graphic novel, whatever it is, I will most likely keep doing shorts here at home, like “World Of Tomorrow” just to keep myself from getting bored. Just to keep busy, because I think Antarctica will take so terribly long that, it’s definitely not going to be the next thing you’ll see from me. I’m not holding my breath. AVC: Do you think that the freedom and speed that you’ve discovered with digital animation has helped the idea of being able to do multiple things at once? DH: Oh, absolutely. I mean, I’m still amazed that I was able to do “World Of Tomorrow” and the Simpsons piece at the same time, and together that took half of the time that “Everything Will Be Ok” took. There’s strengths and weaknesses to every format. I may very well return to film for something else, if the story suits it. I did really appreciate getting it finished so fast. Ten years ago I worked on a thing called “The Meaning Of Life” which was the most grueling, awful project I’ve ever worked on. It just took too long. I’m happy with the result, but it really taught me exactly how not to make a film. You realize you can’t really abuse yourself that much in this stuff. You have to keep yourself happy and motivated above all else. I almost quit after that film, it was so difficult and so lonely. It’s a lonely, lonely job. When you’re doing it for… that film almost took four years, for a short, which, I can never do that again. It’s important to make yourself have fun with it a little bit. AVC: Do you find that your creative motivations are improved by the newer, happier Don, as opposed to the old killing-himself-for-years-to-make-things Don? DH: [Laughs.] Yeah. I’m glad it happened because you learn these things and you also learn as you’re in the project. The idea in your head is a perfect thing. Every time you make a film, you get a little bit closer. You’ve learned a few more tricks, you’ve gotten a little bit better at this or that. You’re never going to make a perfect thing. But you get it closer. Then you finish it and the next project, it’s ideal in your head. It’s like this carrot on the end of the stick, constantly guiding you through these projects where you go, “Oh, I can do that now. Oh, I learned how to do this.” That, I think, is probably why any of us do anything, why we write songs or poems. It’s that artistic thing where you’re constantly chasing that dragon of almost getting it right, never really getting it right, but almost getting it right, and getting a little better every time. AVC: You recently posted something talking about how there’s always at least one line in every interview you’ve ever done that’s the exact opposite of what you said. DH: Oh man, I remember. I didn’t mention what that was in the thing you read? AVC: I think you just gave an example, like, you said a cat was black and the cat was not black or something like that. DH: Exactly. I don’t know if I mumble, or if sometimes I’m doing an interview like this and I can hear the person on the other line furiously writing. Like I can hear a pencil on a pad, trying to get everything I’m saying. It’ll affect what I’m saying, because I’ll slow down [Laughs.] and I’ll try to enunciate. It’s hard. It’s silly. In no universe should an animator be speaking on the record for any reason. It’s not what we do best. It’s weird to be on a stage at a film festival with a microphone like, what, why, really? Again, the films are more interesting than anything I can say, because it’s like the best of myself is right there. But yeah, so many times you read it back and what’s really sad is when they get what you said exactly right and you just still sound like a complete moron. [Laughs.] That’s maybe more discouraging. AVC: Well, I’m recording, so if the interview makes you sound like a complete moron, hopefully it’s because we transcribed you absolutely accurately. DH: It’s fine, I’m used to it. It’s a wonder I’m allowed out of the house.